Leadership isn’t just about knowledge, skills and the ability to inspire change and transformation. Increasingly it is also about worldviews or our visions of life. Worldviews are also a way of life, helping us understanding the beliefs, values and principles that motivate us to certain kinds of action and behavior. Our current worldviews are mostly framed through the lenses of politics and power, strategy and structure, human assets and development. But there is a fresh lens emerging, a narrative of aliveness that taps into the ancient wisdom of our mythic imagination. As this new narrative – which is rooted in nature, art and community – begins to inspire our thoughts and ideas, our world may be truly transformed. 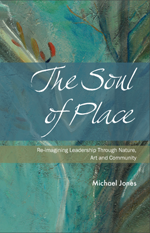 Connecting with and acting in the service of our gift is such a fundamental human need that social upheavals are often motivated not only by financial poverty but the poverty of the imagination that arises when our gifts are not seen or wanted by others. It is in the nature of the gift to transcend what we believe is possible so that our destiny can be fulfilled. This may lead us to wonder what the world might look like if we were rewarded not only for our productivity but for our gifts and deeper humanity as well. Many of us live in a world in which our sense of duty and obligation to a linear way of thinking overrides our deeper intuition and good judgment regarding life and what we believe to be true. This deeper truth is that we are who we are, not despite nature, but because of it. To make our world whole again we need to re-engage in an environment in which nature, including what feels most natural within ourselves, serves as the dynamic central force to which all else is related. Business isn’t an exercise in numbers; it is an enterprise of humanity that is an inalienable part of life. So if we focus on taking care of the people in our enterprise and harness our intuitive capacity to co-create together, business will take care of itself.